TS Gurukulam Entrance Test 2019 Results, qualified candidates list, list of qualified candidates,merit list, TSTWREIS Online Application Form(Apply Online): Telangana Gurukulams have published the TS Gurkulam Etrance Test 2019 (TSTWREIS RJC CET 2019) notification and applications are invited from Boys & Girls of Scheduled Tribes of Telangana State for admissions (School of Excellence Colleges Admissions) into 1st Year Intermediate in English Medium for MPC & Bi.P.C Groups for the Academic Year 2019-2020 in the following institutions functioning under TS Gurukulam. 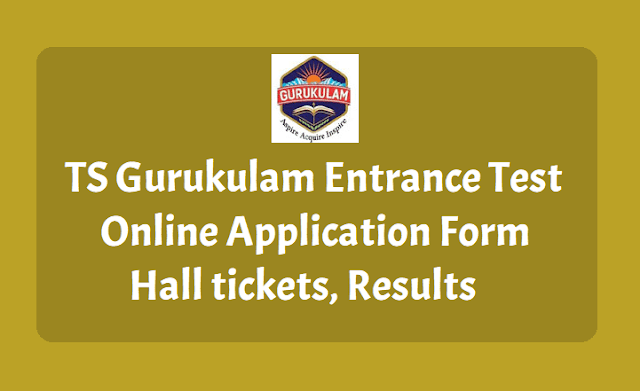 TS Gurukulam Entrance Test 2019 Online Application Form, Hall Tickets, Results, How to Apply Online, TSTWREIS RJC CET 2019 details given here. తెలంగాణ గిరిజన సంక్షేమ గురుకుల జూనియర్‌ కాలేజీల్లో ప్రవేశాలకు మొదటి స్థాయిలో అర్హత సాధించిన విద్యార్థులకు ఈనెల March 10న ద్వితీయ స్థాయి రాత పరీక్ష నిర్వహించనున్నట్లు గిరిజన సంక్షేమ శాఖ ప్రకటించింది. ఎంపీసీలో ప్రవేశం కోరే హైదరాబాద్‌, రంగారెడ్డి, మేడ్చల్‌ మల్కాజిగిరి, సంగారెడ్డి, వికారాబాద్‌, యాదాద్రి భువనగిరి జిల్లాల విద్యార్థులు రంగారెడ్డి జిల్లా మొయినాబాద్‌లోని ట్రైబల్‌ వెల్ఫేర్‌ ప్రతిభా కాలేజీలో, బైపీసీలో ప్రవేశం పొందాలనుకునే విద్యార్థులు రంగారెడ్డి జిల్లా నాదర్‌గుల్‌ ట్రైబల్‌ వెల్ఫేర్‌ కాలేజీలో నిర్వహించే పరీక్షకు హాజరు కావాలని గిరిజన సంక్షేమ జూనియర్‌ కాలేజి ప్రిన్సిపాల్‌ శుక్రవారం ఒక ప్రకటనలో తెలిపారు. రాత పరీక్ష ఉదయం 10.30 గంటలకు నిర్వహించనున్నట్లు పేర్కొన్నారు. Eligibility: All the ST students (Boys & Girls) of Telangana who are appearing for SSC March - 2019 in TW Residential Schools, Ashram Schools, Govt. Schools, Zilla Parishad Schools and other Govt. Recognized schools and they should have secured at least B2 grade(7 points) in aggregate and also secure B2 grade in English in SSC Public Examination 2019. Age: The age of the students shall not exceed 17 years as on 31.08.2019. Note - (*) Fields are mandatory. Personal Information: Candidates should fill the their personal information in the required field. 15. Declaration by the candidate : I hereby declare that the particulars given above are true and correct to the best of my knowledge. In case any information given by me is found false,I will be liable for any action to be taken by the Gurukulam Authority. (Reprint Hall Ticket) Please enter your login information here like Registration No. OR Hall Ticket No. Sir on 31st January, many areas Net server problem and exam centre is in disabled mode, many students missed the chance, show extend one day online or give chance for manual submission by specifying certain submitting centre.